It's Sunday evening and time for the Koh Samui, Thailand weekly weather update; 22nd October – 28th October 2018. It's been a very long with getting up very early, travel from Khao Lak where I am to Phuket. Run a very hard hill race, drive back to Khao Lak. Start to work and teach a PADI IDC upon arrival back in Khao Lak. Before you know it the evening is gone. However, first things first. The Koh Samui weather today. Maximum temperature reached 32C but it felt a lot warmer. It was hot and humid. For late October a nice day. In Khao Lak we had a typical day, like almost every day last week. Nice and sunny in the morning and rain during the afternoon. The evening is dry again. maximum temperature here also reached 32C. It is however a lot cooler during the night and early morning, down to 22-24C. This morning I drove to Chalong in Phuket, at around 3.30am. I participated in a very steep hill run race. 6km up and 6km down. It all went well but it was a very hard race considering it was such a relative short distance to cover. Koh Samui, Thailand weekly weather update; 22nd October – 28th October 2018; This is a picture of an Isaan restaurant almost opposite the Bangkok-Samui hospital on the ring road in Chaweng. The small 'sala's', the place where you sit, are very typical for these kind of restaurants. Last week the weather on Koh Samui was a real nice mixed bag. Some days were sunny. One day was rain all day and most days had a nice mix. Relatively nice for this time of the year. Next month the rainy season can be expected and we may have rain all day long. Every bit of sun we can catch now is nice! Maximum temperature last week reached 33C and the minimum was 24C. 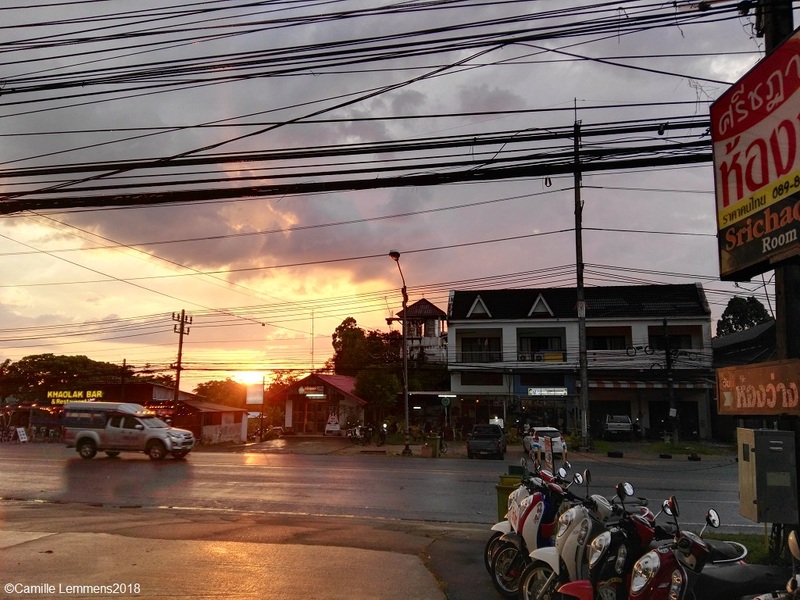 Koh Samui, Thailand weekly weather update; 22nd October – 28th October 2018; Sunset in Khao Lak this evening, in front of my hotel Srichada. The sun sets over the ocean but unfortunately you can't see the water. It had just stopped raining and the clouds were breaking up. Next week is looking good. Plenty of sunshine is predicted with just an occasional shower on Wednesday and Saturday. Come Sunday there may be more clouds and more rain. Enjoy next week, it looks like a nice week ahead of us. A day late but here we are with the Koh Samui, Thailand weekly weather update; 15th October – 21st October 2018. Right now, Monday morning around 11.30am it's nice and sunny with a current temperature of 31C. It feels a lot warmer though. Last week saw a mixed bag kind of weather moving over Koh Samui. Some showers early during the week, mostly early in the morning. Nicer and sunnier weather towards the end of the week. Maximum temperatures reached 34C and the lowest temperature recorded on Koh Samui last week was 23C. Yesterday saw the first Skal Samui 10 mile run and 2 mile obstacle course at the Namuang stadium. For a first time event it went all really well with over 500 participants and a little bit of surplus for this charity event to hand out later. Koh Samui, Thailand weekly weather update; 15th October – 21st October 2018; A view high up on the mountain from the Jungle Club. This is located at the Southern part of Chaweng, even past Chaweng Noi. 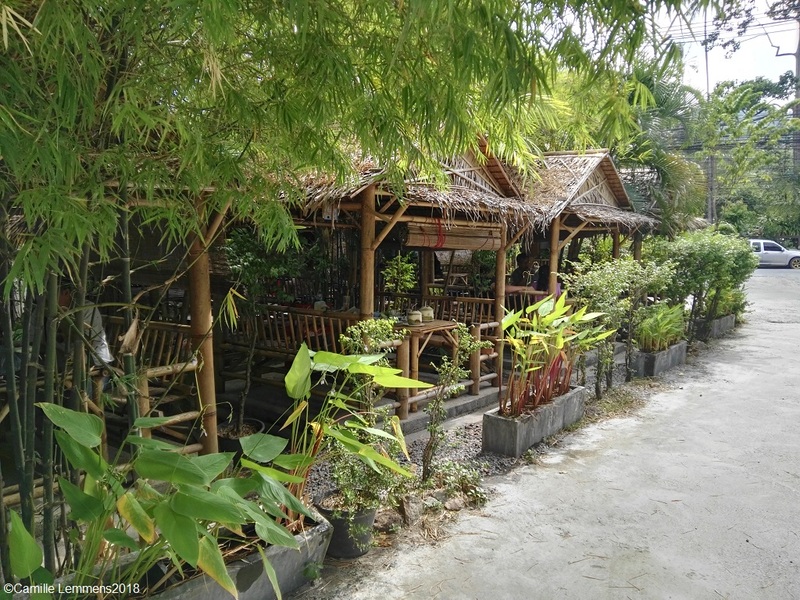 A relaxed bar and restaurant with a great view over the Chaweng beach and bay. This week should be fairly sunny, with an occasional shower. Until Friday, that day there might be plenty of rain, well into the weekend. 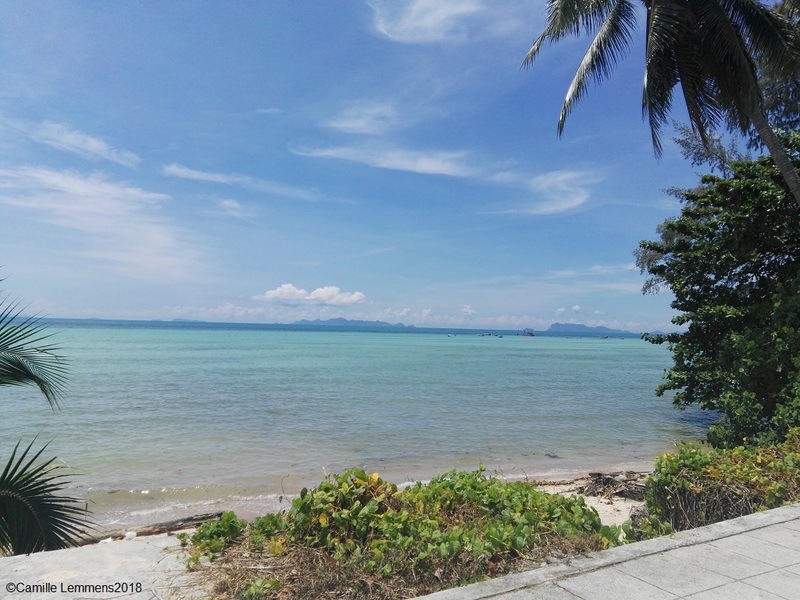 It's Sunday morning and time for the Koh Samui, Thailand weekly weather update; 7th October – 14th October 2018. No running this weekend since I'm still suffering from a mild cold. It just isn't going away! Maximum temperatures reached 32C this week and it dropped to 25C at the most. We had a lot more rain last week then expected. As you can see though, the temperatures were still nice though. We had some sunshine but most days there was some rain. Nothing too bad but still wet. Sometimes a few hours at a time. 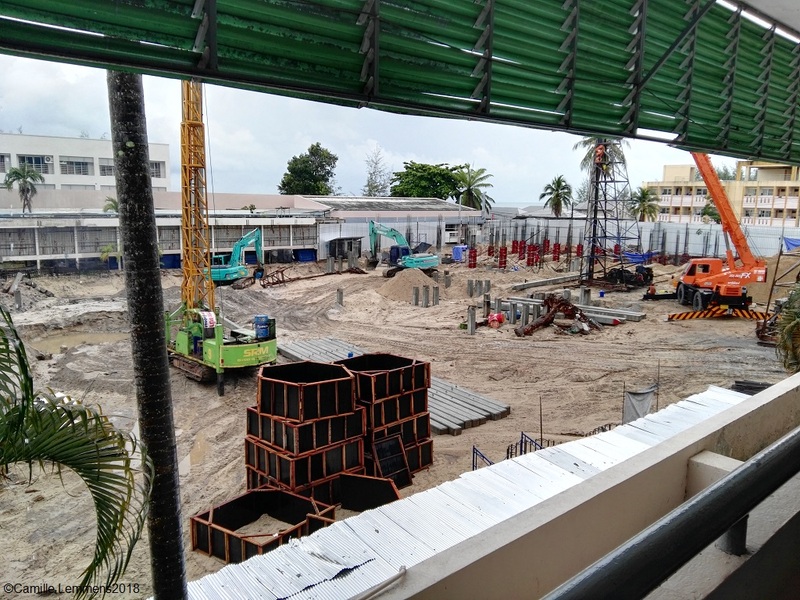 Koh Samui, Thailand weekly weather update; 7th October – 14th October 2018; Massive construction going on at the government hospital in Nathon. The whole 'heart' or center of the hospital is being dug up. Not sure what is being constructed, it's too early to tell. It's part of a big make over, construction has already been going on for well over a year. This seems to be a massive job though. The forecast for the next seven days is looking good. Overcast but supposedly dry until Wednesday. A little bit of wind and possibly a shower after that but also more chance of sunshine. 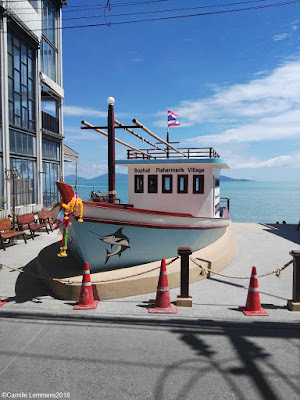 Sunday morning, another week gone and once more time for the Koh Samui, Thailand weekly weather update; 1st October – 7th October 2018. No running this morning since I was knocked out by a cold the last two days. I will try to give that another go tomorrow. Surprisingly it's sunny and dry this Sunday morning, in total contrast to last week. Last week it was overcast and wet everyday except for Monday. During the afternoons it cleared up and went dry with a bit of sunshine here and there. Today it is 29C at 10.30am and it looks like it will stay dry for the remainder of the day. Koh Samui, Thailand weekly weather update; 1st October – 7th October 2018; Just outside Nathon, the beach with a view towards Koh Phangan. This picture was taken during the last week of September. The first week of October saw quite different weather! Next week could see a mix of rain and sunshine. Rather typical October weather. However, it's not the start of the rainy season yet. At least, that's what I believe. Stay tuned for more updates next week and enjoy your time on the island. We're already three days into the new and it's high time to say Welcome to October 2018. The first day of this new was still nice and sunny. However, yesterday and today have been mostly wet and grey. Plenty of showers with an occasional glimpse of the sun during the mornings. At 11am it's 28C and cloudy. This may hold on until after the weekend when it hopefully clears up a bit. October in general around Koh Samui can be a mixed bag. In the beginning of the month it still may be nice and sunny. However, later on during the month, the closer we get towards November and the rainy season, it may get wetter and wetter. Welcome to October 2018; A brand new copy of a fisherman's boat, in concrete, has been recently unveiled in Fisherman's Village. It's in the middle of the village and hard to miss. Come Sunday 21st October, there will be the Skal Koh Samui 10 mile run and a 2 mile obstacle course. This will all be happening down in Baan Namuang. You can sign up online or a few selected hotels. If you're on Koh Samui during October, I hope you will enjoy your stay and find what you're looking for.